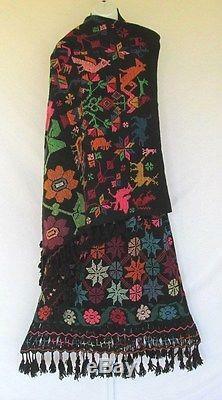 VINTAGE 1960s - 1970s AUTHENTIC HAND MADE MEXICAN BOHO HIPPIE ETHNIC SKIRT & SHAWL TASSELS BLACK WOVEN WOOL COLORFUL DESIGNS. 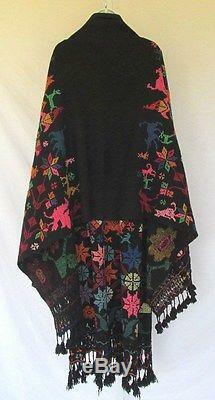 Just look at the pictures and see how beautiful this skirt & shawl are. 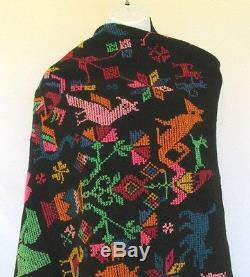 These were hand made in Mexico of a wool fabric. 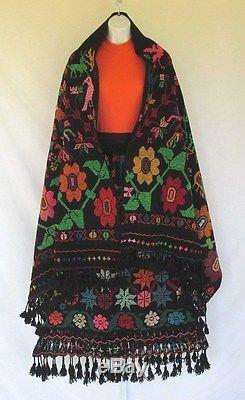 The colorful ethnic designs really stand out against the black background. THE SKIRT has hook and snap closures on the side. The bottom hem is trimmed with dangling tassels all the way around. 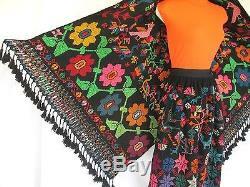 THE SHAWL also features colorful ethnic designs on a black background. The ends also have dangling tassels. This shawl can be worn in a variety of ways. 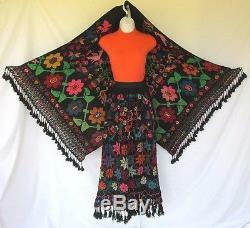 As the pictures demonstrate this skirt and shawl are in excellent vintage condition and ready for wear!!! The hook closure can be moved to make it a bit larger or smaller SKIRT HIPS are free flowing SKIRT LENGTH 38 1/2" including the dangling tassel fringe SHAWL LENGTH 80". 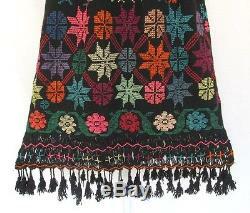 85 1/2" including the tassel fringe SHAWL WIDTH 32 3/4". WE STAND BEHIND ALL OUR ITEMS!!! WE STRIVE TO MAKE ALL OUR CUSTOMERS HAPPY!! ALL OUR LISTINGS COME FROM A CLEAN, SMOKE & PET FREE ENVIRONMENT. LOOK AT OUR OTHER CURRENT AND FUTURE LISTINGS OF FINE VINTAGE JEWELRY, CLOTHING, HANDBAGS & MORE. 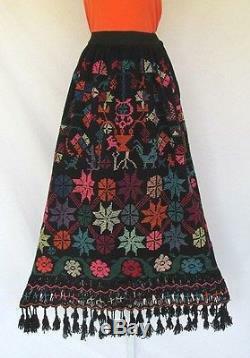 The item "VINTAGE 1960s 70s MEXICAN ETHNIC BOHO HIPPIE SKIRT & SHAWL TASSELS WOOL BLACK" is in sale since Tuesday, December 22, 2015. 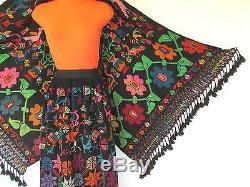 This item is in the category "Clothing, Shoes & Accessories\Cultural & Ethnic Clothing\Latin America". The seller is "badger201143" and is located in Glendale, Arizona. This item can be shipped worldwide.